Here at TuscanVines our love for Italian wine and fine food is well known. We enthusiastically embrace the wine lifestyle; the idea that life slows, bottles uncork and family relaxes at the rustic kitchen table. Wine and food are inextricably linked with family and conversation. Nowhere is that more true than Italy and in that spirit, we feature an extensive Recipes Page, with some of our favorite recipes that we’ve created. 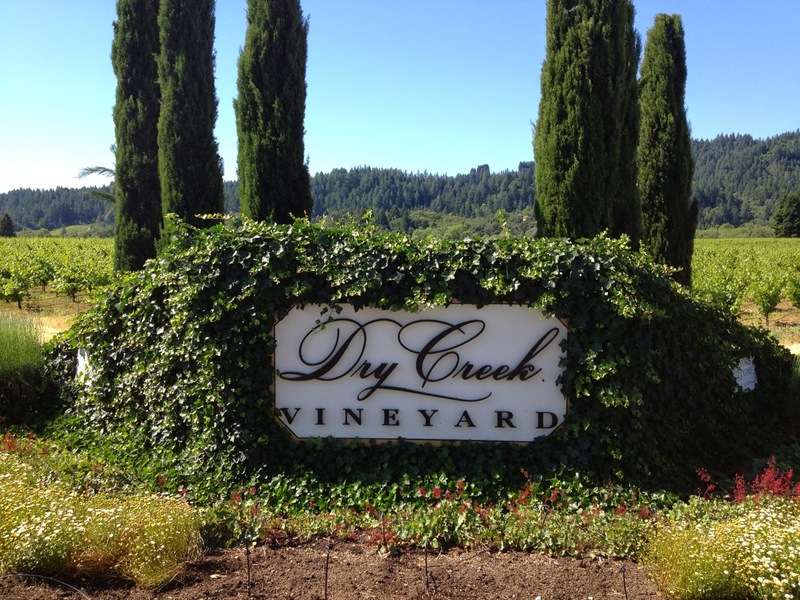 I’ve been a Dry Creek Vineyard VIP Club Member since the early 1990s, visited the winery several times and long adored their wines. So when I was approached to create two recipes specifically designed to pair with Dry Creek’s May Club Shipment, not only was I honored, but I jumped at the chance! Below you will find two simple, healthy, delicious recipes that we created specifically for the wines contained in Dry Creek’s May Wine Club shipment. The text for each recipe is included in the Dry Creek Newsletter as part of your shipment. However, below you can see photos of each dish, along with additional tips and commentary on the paired wines. The first dish was designed for the 2012 Russian River Pinot Noir. This elegant, fresh red has flavors that play very nicely with the smokey notes from the pancetta and the earthiness of the mushrooms. 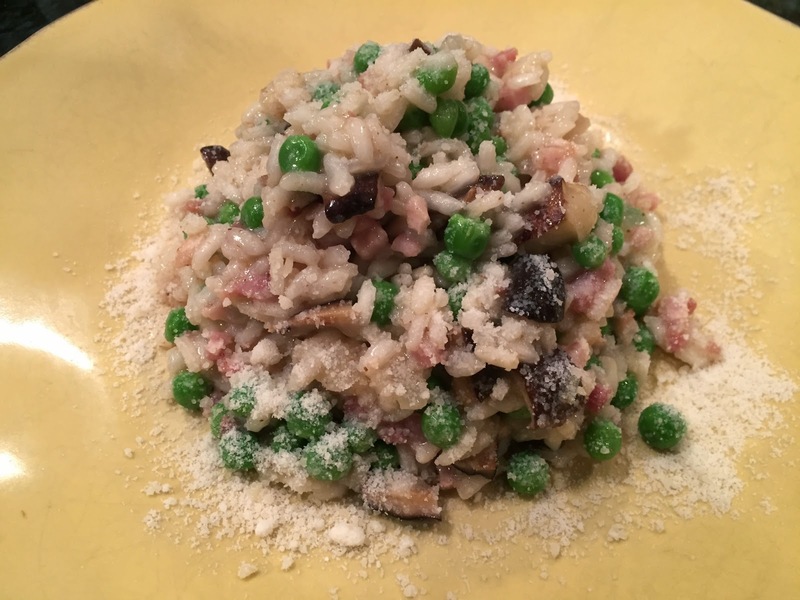 If the idea of trying risotto makes you nervous, see here: How to Make Risotto. Warm the chicken broth in a stock pot and keep handy on the stove. Separately, in a pan large enough to accommodate the risotto, saute the mushrooms over medium high heat until they begin to caramelize. Transfer to a bowl and set aside. Add the pancetta and onion to the pan and saute over medium heat until the onions soften and the pancetta renders its fat. Add the rice to the pan and “toast” stirring for 1-2 minutes. Begin ladling the chicken stock into the rice one ladle at a time. Stir continuously between each ladle until the rice absorbs the stock, then add the next ladle. Continue until the rice is al dente. (like pasta) If you run out of broth, you can use warm water. Once the rice is cooked, add the peas and mushrooms and stir to incorporate. 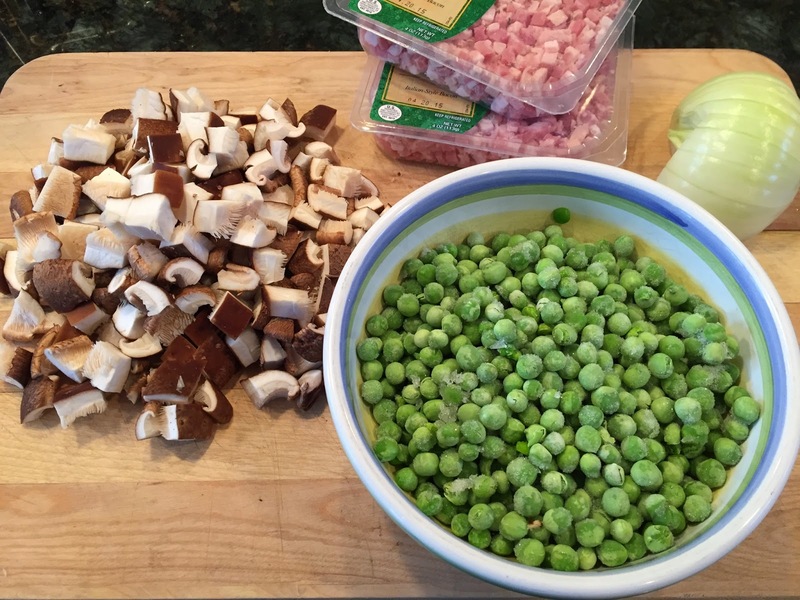 The peas will thaw/cook in less than 2 minutes. Pass grated Pecorino cheese at the table. 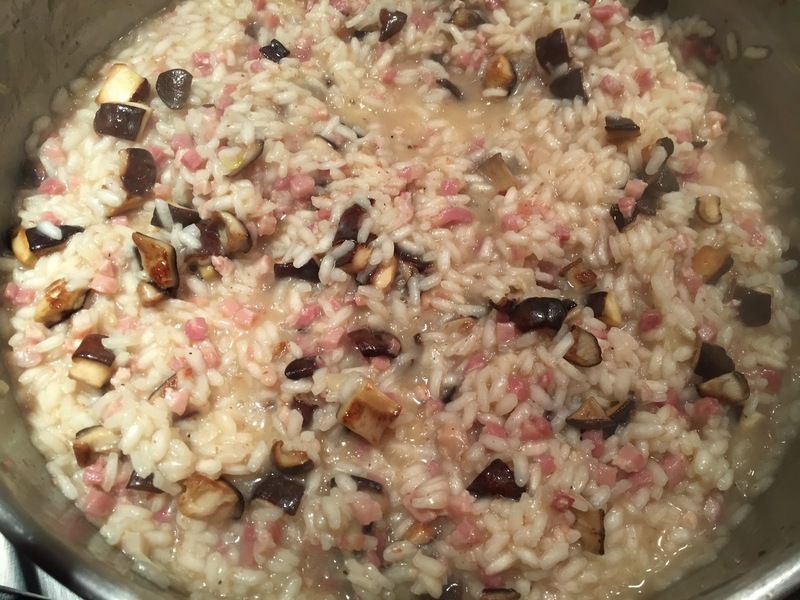 The 2012 Russian River Valley Pinot Noir made for a wonderful pairing with the risotto. The notes of the mushroom and pancetta in the dish really brought out similar notes in the wine. In the glass, the wine is a bright violet color clear to the rim. The enticing aroma offers up notes of freshly crushed strawberry, clove, and foresty pine notes. In the mouth, the wine is elegant and graceful. The strawberry and cherry notes plump nicely against the smokey pancetta and the foresty woodsy notes compliment the mushrooms so well. Lively, juicy and fresh the wine is fruit driven with slight cola and spice notes lingering on the finish. Balanced well, this is very tasty right now, but could cellar easily for 2-3 years. 89 points. The next dish was created for the 2012 Beeson Ranch Zinfandel. This robust red has all the classic hallmarks of Sonoma Zinfandel. The char on the chicken and the slight heat from the smoked paprika and barbecue sauce really bring out the spice and fruit in this wine. 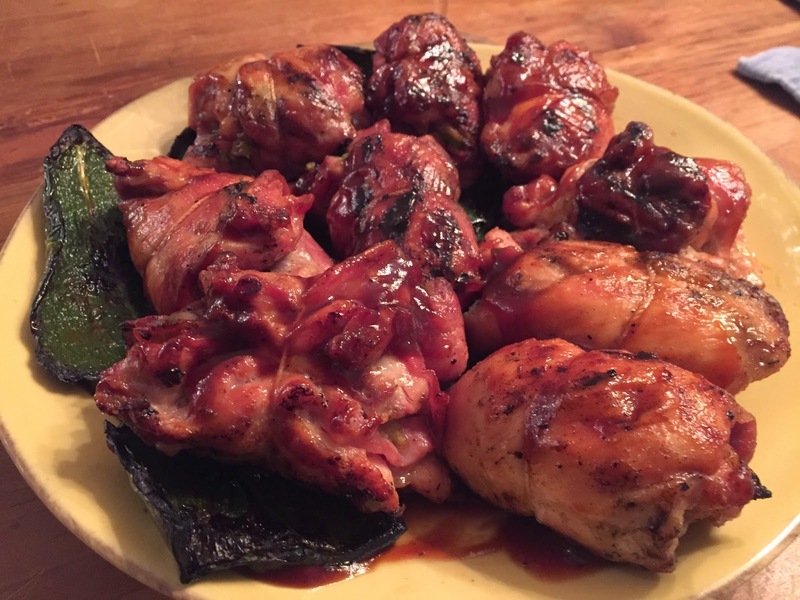 2 packages skinless, boneless chicken thighs, about 4 pounds. With the ragged edges of the thighs facing upward, lay a slice of prosciutto and a slice of avocado on the chicken. Season lightly with salt and pepper. Roll up and tie with butchers twine. Do this for each thigh and set on a platter. 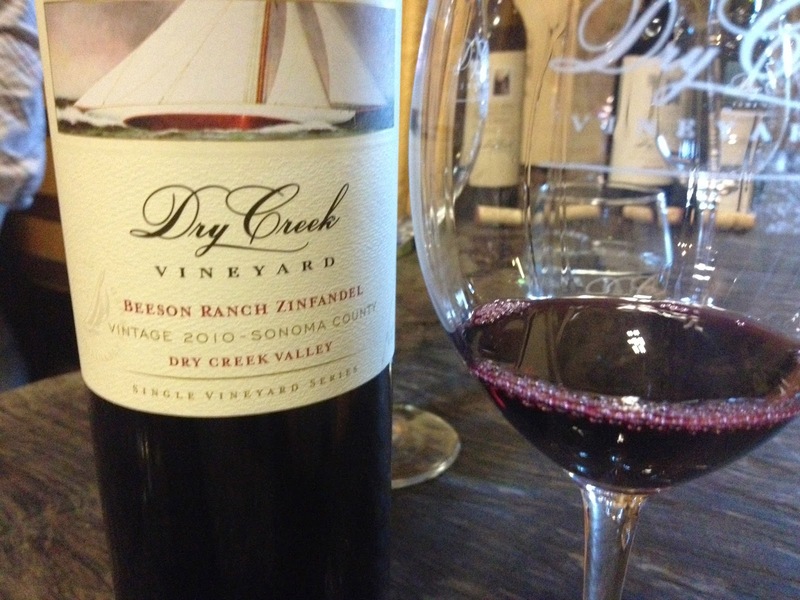 The 2012 Beeson Ranch Zinfandel is one of my favorite wines from Dry Creek Vineyard. Inexplicably, I forgot to photograph the current vintage when we tasted the wine, but suffice to say, it looks as it did here: A Day at Dry Creek Vineyard. The 2012 is a blend of 77% Zinfandel – just over the legal minimum limit – along with a healthy dose of Petite Sirah that adds substantial depth to the color and heft to the wine. On the nose, the wine is loaded with rip “Zinberry” aromas – wild brush notes, spices and a touch of lovely eucalyptus. On the palate, the grip from the Petite is notable and frames the juicy, ripe black and blue fruit flavors wonderfully. Tannins are dusty with mineral traces and the finish has spices and cocoa. Lovely wine and along with Somers Ranch, my favorite zins from Dry Creek. 92 points. 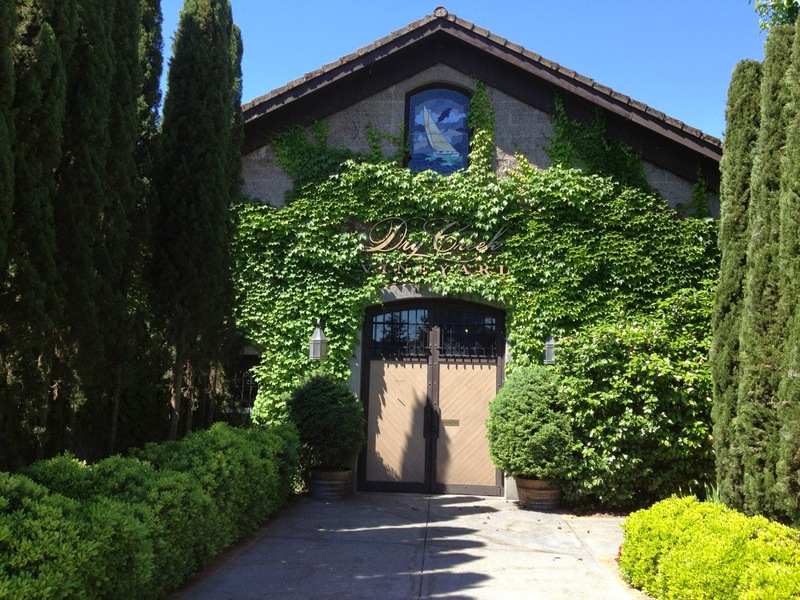 Fans of Dry Creek Vineyard may also want to see my interview with Winemaker, Tim Bell. Cheers Dennis, thanks! It was a lot of fun to do this and really give some extra thought to the flavors in the wines instead of just relying on more generic wine-food pairing notions.